60 fun and challenging levels! 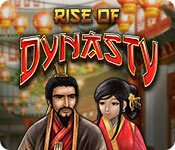 Rise of Dynasty is rated 3.5 out of 5 by 13. Rated 5 out of 5 by mccurdynk from Better Game than Reviews Show I'm with another reviewer, this game is better than the reviews show. As the other reviewer wrote, the story line is slow and gets irritating to have to go through every level. The graphics are simple. But the game is very very good and fun to play. If you can be patient through the story line it is worth a try. I would truly give this a 4 star but wanted to get the overall rating up because it is worth more than 3 stars. Rated 5 out of 5 by ganjagamer from Above Average Match 3 I honestly don't understand the mostly unfavourable reviews this game has gotten. Sure, the building aspects might be pretty bare bones, but the match 3 gameplay is spot on. Good graphics, good sounds, responsive controls. I don't see what all the fuss is about. This is definitely a solid match 3. If you like Asian inspired themes you will love this one. Highly recommended if you enjoy match 3 games. Rated 5 out of 5 by Carodan from Relaxing Match 3 game I liked this game as it was very relaxing!! 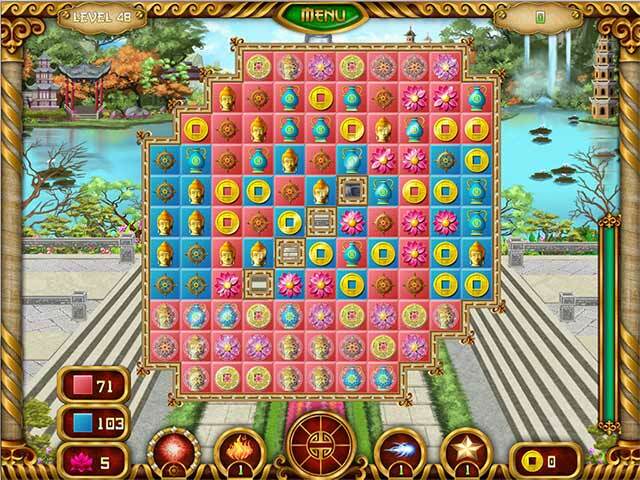 Rated 4 out of 5 by Aleksa2008 from Funy Match 3 Game I loved this very pleasantly game! Good colors, nice pictures, fast action. Rated 4 out of 5 by pennmom36 from Get's A Little Monotonous After years of being ruled by a Tyrant who oppressed and enslaved his own people, the people rose up against their leader to dethrone him and start anew. Years of civil war and tyranny have left the farmers with improper equipment to farm with and the new leader has vowed to help his people help themselves in the rise of this new Dynasty! You can play this Match 3 game in Timed or Relaxed modes, each level requires you to clear all blue tiles first, as you progress you will be required to clear red tiles as well. Once these tiles have been cleared, you will need to collect a special item or items by making matches below the items until they fall off of the board. Creating matches of 4 or 5 tiles will fill the amulet located at the bottom of the board, when the amulet is fully charged you can click on it to release a powerful lightning storm which will clear several random tiles on the board. You want to use the amulet whenever you can because each level starts with an empty amulet. Power-ups can be earned by making matches as well, and there may be several available because you can carry over power-ups to the next levels. some of the power-ups clear a 3x3 area and can be placed anywhere on the board, the fire power-up clears an entire row, each new power-up destroys tiles in a specific way either random or in a cross shape etc. 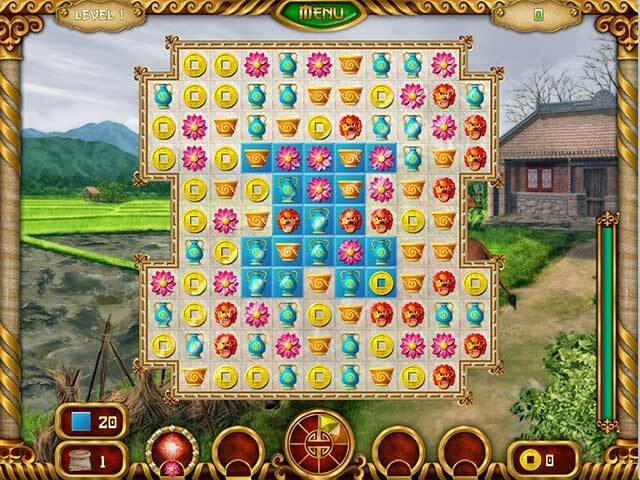 The coins that you earn will be used to rebuild the farms, buy cottages and houses. You will also buy sawmills, lumber mills and even grain mills. You purchase these buildings one at a time in a specific order, you cannot choose which buildings to buy. In my opinion this Match 3 game didn't have any wow factors to keep my interest, game after game, it was just more of the same goals as the level before. The tiles had lions, bowls, bottles coins and flowers, nothing special, no eye candy. Some of the tiles are "tangled" and you have to make matches of that tangled tile to release the immovable tile. This is a good Match 3 game, but can become repetitive as you progress, enjoy! 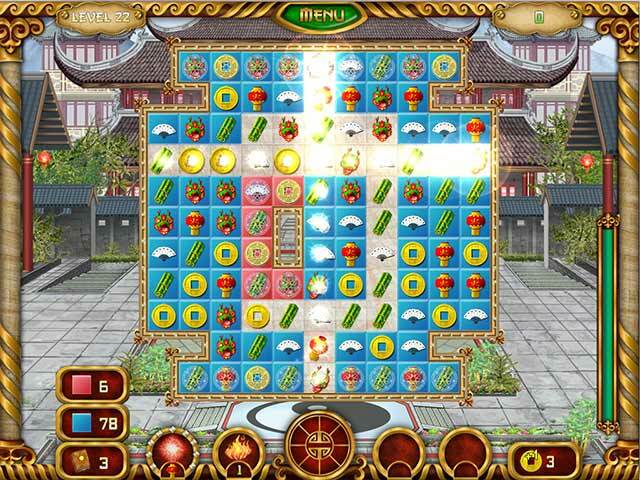 Rated 4 out of 5 by mrm2006 from Rebuild The Tang Dynasty This is your typical match 3 game. Match 4 or more to get bonuses. After clearing the board of blue tiles, match more to drop the "special item" off the bottom of the board. There are hindrances as well - iced items, etc. The music was incredibly relaxing and soothing. The background picture never changed which was unfortunate because I think the game could have offered more in that way. The story is basically the one told on the game description page and does not continue. Earn coins by passing levels and use them to build various houses and other buildings. While relaxing and addicting (to a point), something about this game just didn't "wow" me so it's not a purchase for me, but I strongly encourage everyone to give the hour-long free demo a try. Happy Gaming! Rated 3 out of 5 by TucsonWoman67 from Just average This match 3 game is very ordinary and quite repetitive. What is the difference between getting a stone to the bottom vs getting a treasure to the bottom? Not much. Also the sound effects are average, The machine gun noise is incredibly loud and loathsome. BFG, there are a lot better match 3 games than this one. Rated 3 out of 5 by tacomataz from It's ok This game to me is just ok. The graphics are good and the levels are somewhat of a challenge but I have 2 gripes about the game. The music as you are playing a level sounds more like if you were playing a game with an Irish theme to it. What I guess I am trying to say is that the music should have more of an Asian sound to it. The other gripe is when you build something it has a set place to go and I think it would be more fun to be able to place things any where you like. Other than my 2 gripes I think this game is an ok game and I would recommend the game for anyone. Rated 2 out of 5 by knitnow from save your $$ and credits A Match-3 game has to be pretty lame for me to pass on it, and this is one of the few. This game is a no-frills, easy to play, basic Match 3...which is not necessarily a bad thing. However, the graphics and pace of play in this game detract from the game. The game loads slowly and the graphics are blurry . There are are just too many other choices to make this game worth the investment of time and money.